Dine Downtown is an annual eating event for Sacramento. For one week in January, several Capital City restaurants offer $30 Prix Fixe meals. The idea is to convince people it’s a good idea to spend money on dining out, after the New Year’s and Christmas celebrations. For many people watching their wallets, $30 is the right price for dining out. We went to Rio City in Old Sacramento. It’s by the water and enjoyed the relaxed, sophisticated ambiance. 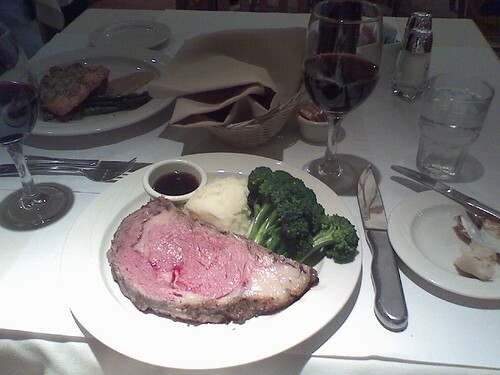 On the Prix Fixe menu, I ordered the prime rib, medium rare. So juicy and tender! We also did a bottle of 2005 Renwood Old Vine Zinfandel from Amador County. We had a tasty, affordable night out! Growing up, I remember craving instant ramen for breakfast. My dad wouldn’t let me. He said it didn’t have any nutrients. As a grown-up, I eat instant ramen whenever I want to – breakfast, lunch or dinner. It’s my comfort food for all seasons. After a bad day at work, slurping up the noodles makes me feel better. When I have a cold, the savory broth soothes my throat. I have this “anything goes” attitude when it comes to my instant ramen. I like to add fried eggs and butter to the hot noodles. I also mix in leftover veggies to the broth. 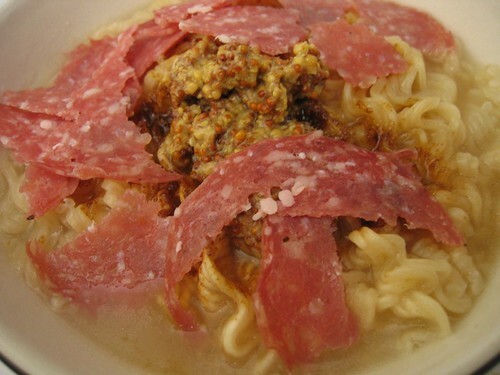 This is one of my favorite ramen mash-ups: Chicken mushroom-flavored powder, salami slices and Dijon mustard. Yum! When possible, I love fresh ramen. My favorite spot for handmade noodles is Sapporo-ya in San Francisco’s Japantown. This is my personal ramen heaven: a window seat at Sapporo-ya, where I can do some people-watching on the street below and gazing at steam rising from a big bowl of hot broth, noodles, veggies, meat and seafood. If I didn’t have any attachments in the U.S., I’d head to Japan and learn how to make the perfect bowl of ramen. I love kitchen appliance gifts for Christmas. It’s probably because we didn’t include any requests for kitchen tools on our wedding gift registry. So, I was thrilled when my parents mailed us a Cuisinart Slow Cooker for Christmas 2008. 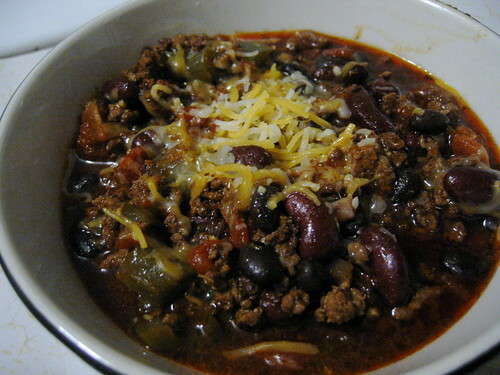 I used it to make this savory, hearty football-watching treat. 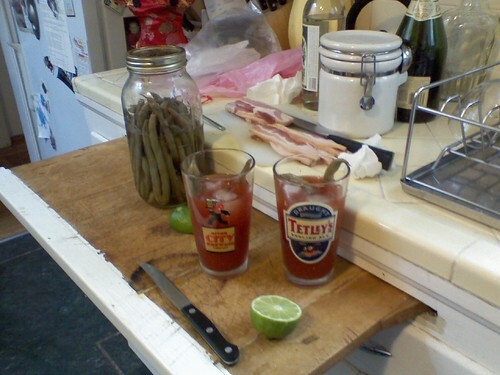 On New Year’s Day, I made Blood Mary’s for the first time in my life. My SF buddies thought they were tasty, especially after a night of heavy food, drinks and more drinks. I wasn’t a big fan of Blood Marys. I ordered one a few years ago from a restaurant next to the Exploratorium. It wasn’t great and I never ordered another one again.